Osaka ended up on our itinerary as a more affordable solution to staying in Kyoto, whose temples and shrines we wanted to visit in the peak of the cherry blossom season. We stayed in Osaka for 4 nights, making day trips to Kyoto and Nara, but ultimately we got to enjoy the city more than we expected, considering it our temporary home, and deciding on first soaking in the atmosphere and then sightseeing when we felt like it. Osaka Station and its surrounding buildings, shopping malls and streets became our base from where we'd start off in the morning and then return to in the evening. Osaka is a huge city, with 19 million inhabitants in the metropolitan area, making it the second largest city in Japan by daytime, and third largest by nighttime after Tokyo and Yokohama. Knowing that, and thinking about how much we roamed all around Tokyo, I feel like we at the same time barely scratched the surface of Osaka and got to experience the vibe of the town pretty well. We visited the touristy Osaka Castle, but also had late night tea and cookies at Starbucks in the Osaka Station, taking in the bird views of the arriving and departing trains, going through the magazines on offer and using their WiFi, just like the local youth did; we queued for an hour for one of the best okonomiyaki in town, and had udon in a place where two sumo fighters were having their dinner; we had French toast for breakfast in a cute cafe under squeaky railway, and a ramen in a joint where people were so drunk that they would fall on the floor and then not get up for a couple of minutes (and it felt safe all the same); we passed through lively Dotonbori in the evening- an attack on the senses with its flashy signs and countless restaurants, and marveled at a city skyline from the rooftop of Umeda Sky Building. As more as I'm getting to know and learn about Japan, I'm realizing that it's the experiences that stick with you the most. We discovered a breakfast place called Afternoon Tea on our second day, located in the Grand Front shopping mall, just next to the Osaka Station. They had scones (! 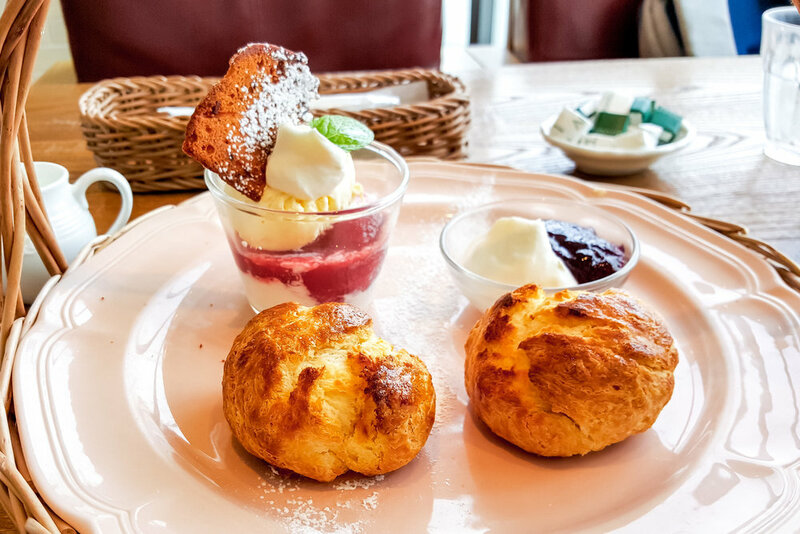 ), a crumbly little pastry served with jam and clotted cream, that grew close to our hearts almost ten years ago in England, and even though we tried to recreate it a couple of times at home, it wasn't quite the same. It wasn't the same in Osaka either, but we loved it still, enjoying it with a view of busy Osaka streets. With a risk of sounding like a consumerist, I (actually, both of us) loved browsing the shops of Grand Front- and this is coming from a person that at home tries to avoid shopping malls as much as she can- finding them soulless, crowded and impossible to breathe in (not a fan of dry air condition air). But the shops there were actually a careful selection of Japanese design homeware, cosmetics, sport, clothing, jewelry, and most importantly- stationery. For a stationery geek that I am, there is no place quite like Japan to get stocked on cute/beautiful (hedgehog print!) letter sets and cards, (polar bear print) washi tape and (asparagus and toast on a plate) memo blocs, (cute animals) stick markers and (Shinkansen themed) writing paper. After breakfast at Afternoon tea, we headed to Osaka Castle, the only historic site we did visit in the city. The building was started at the end of the 16th century and lived through many misfortunes (mostly fires and sieges) and consecutive reconstructions until its final repair work in 1997. I have to admit that the iconic five storey structure atop of imposing rock walls, surrounded by a water-filled moat is far more impressive as viewed from the outside than from the inside. Only when we got in, did we learn that it's a concrete reconstruction, intended as a modern museum back in 1997, a bit outdated now. We did, however, enjoy the views from the top floor, looking at the skyline of a modern metropolis over a golden tail of shachihoko sculptures, adorning the roof of the castle. Shachihoko is an animal from the Japanese folklore with a head of a tiger and a body of a fish, believed to be able to cause the rain to fall and therefore protect the castles and temples from fire, which didn't work out in the case of Osaka castle, sadly. We spent the evening in and around Osaka Station and its surrounding buildings- fascinated by the lights, the trains and the endless flow of people. We wanted to try the udon joint that was highly rated on Tripadvisor, and situated in the 2nd basement floor of one of the Osaka Station buildings. As we already experienced before in Japan, finding the address situated underground, inside a building that has dozens of other restaurants is everything but easy- but we found it anyway, thanks to our foodie stubbornness and always-ready-to help locals that navigated us from building to building until we managed to find it. I am not sure if it was the tiredness or the satisfaction of finding the place, but we both proclaimed that udon to be the best we've tried. The joint had a steamy atmosphere, with cooks walking around in rubber boots and washing the floors down with a hosepipe. The eldest cook decided to show us how to eat the noodles- by taking a pair with your chopsticks, and then pulling them out over the rim of your bowl. When a pair of sumo wrestlers walked in in their robes, we felt as if in a scene of a Japanese movie, Tampopo perhaps. After dinner, we sneaked up to the terrace of above mentioned Grand Front shopping mall (it was already closed and a guard did come to ask us to come in when he realized there are two intruders walking around the building late in the evening). Still, we had enough time to marvel at the rainy city by night, its flashy lights reflected in the wet pavements and the bright red Osaka Ferris wheel glowing in the night like a lighthouse. Next morning, before leaving Osaka, we wanted to see the city from above one more time, so we headed to Umeda Sky Building, just a short walk from the station. The sky reflecting building consists of two towers connected by the circular Floating Garden Observatory at a 173 meters height, open for visitors. From up above, you could see the city spreading in all directions, the airplanes landing and taking off above the residential high rises; pools and tennis courts on top of the buildings; the Ferris Wheel- a pop of red in a hazy cityscape. We had a beer in the top floor bar- it was my birthday after all, and what a way to celebrate. Afterward, we queued for lunch in the basement floor of the building at apparently very good okonomiyaki joint. 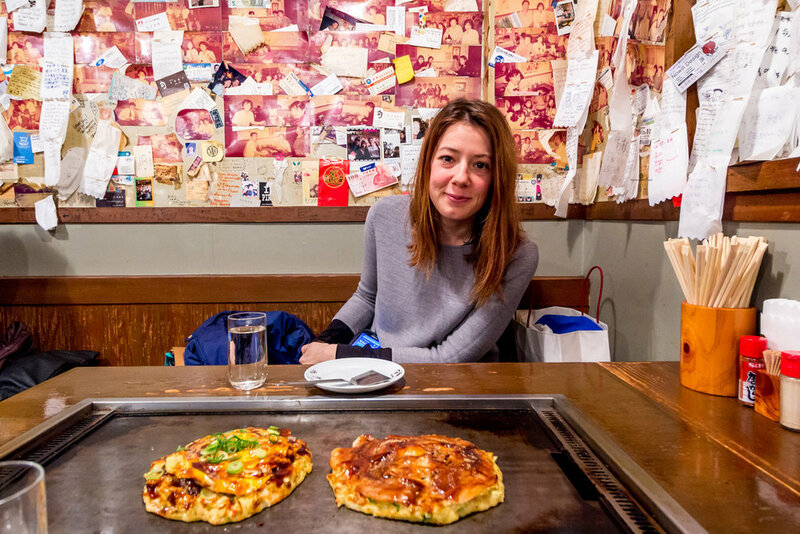 Okonomiyaki is usually explained as a savory Japanese pancake- I wouldn't exactly call it that as it is a thick batter with some meat or seafood, cabbage or other veggies in it, grilled on a table in front of you. 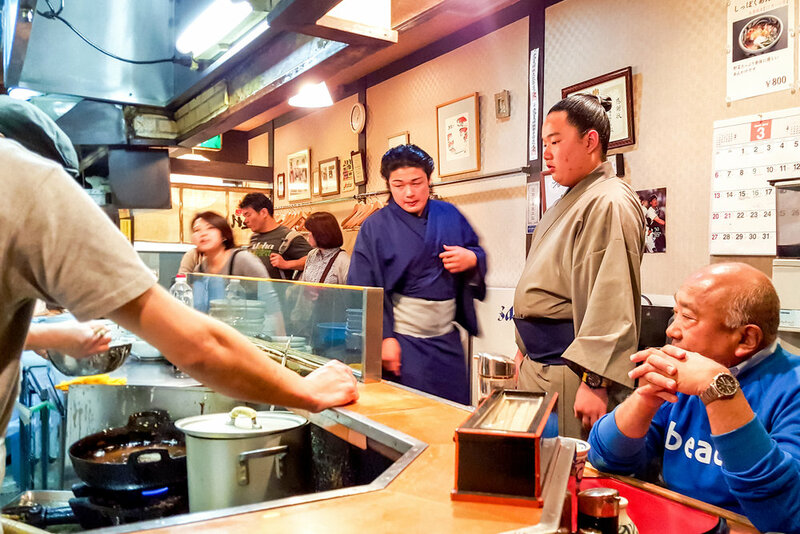 The okonomiyaki was delicious, but as foreign visitors, we also got a lot of attention from the cooks and ended up on the other side of the kitchen bar, posing for photos with the entire staff! It was one of those typical Japanese travel experiences. We stayed in Osaka during our first visit to Japan two years ago, since then, we visited Japan for the second time and came back just this month. I'll try to catch up with my posts and share with you our latest Japanese experiences as soon as I can. Until then, I will be posting some photos on my Facebook and Instagram accounts, so be sure to follow along!